Live 'Scarface' Cast Reunion Tomorrow! The highly anticipated Blu-ray release of Brian De Palma's landmark 1983 crime drama is coming in the few weeks, and in celebration the cast reunites via a live streaming event on Facebook! As previously reported, Universal Studios is preparing 'Scarface' for a Blu-ray release on September 6. On August 23, 2011 at 11:15pm EDT Universal Studios Home Entertainment reunites the cast and filmmakers of the iconic underworld epic, Scarface. Stars Al Pacino, Steven Bauer, Robert Loggia, F. Murray Abraham and producer Martin Bregman come together to celebrate the legacy of the film that redefined the ganger genre forever and became a cultural touchstone for an entire generation. 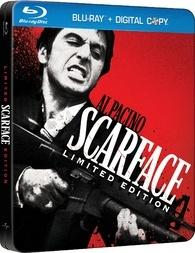 The event coincides with the first-time launch of Scarface on Blu-rayTM on September 6, 2011. Considered one of the most influential gangster films ever made, 'Scarface’s' gritty depiction of Tony Montana’s lethal ambition has made it a cultural touchstone that spans generations. Now, fans can experience the film’s raw power in the newly restored, high-resolution, high-definition picture and explosive 7.1 audio for the first time ever. Exclusive new bonus content created especially for this release reveals the film’s iconic legacy as one of the greatest crime sagas of all time. For a limited time only, 'Scarface Special Limited Edition' Blu-rayTM comes with collectible SteelBookTM packaging, ten exclusive art cards, a digital copy of the film and a DVD of the original 1932 'Scarface,' making it a must-own addition to every film fan’s library. And, for the ultimate collector and cigar enthusiast, an elegantly hand-crafted Scarface-themed humidor will be made available in an exclusive, never-before-available, limited edition. Created by the renowned Daniel Marshall, the humidor’s exterior is hand painted and polished with the Marshall’s trademark “1000 coat brilliant finish.” The interior – made with untreated Spanish cedar – will properly condition and age approximately 100 cigars at optimal humidity levels. Limited to 1,000 worldwide, each individually numbered humidor comes embellished with custom medallions inspired by the iconic film and includes a certificate of authenticity. A masterful collaboration between acclaimed director Brian de Palma ('The Untouchables,' 'Carlito’s Way') and Academy Award®-winning screenwriter Oliver Stone ('Wall Street: Money Never Sleeps,' 'Platoon'), 'Scarface' features extraordinary performances from a powerhouse cast that includes Academy Award® winner Al Pacino ('The Godfather'), Academy Award® nominee Michelle Pfeiffer ('The Fabulous Baker Boys,' 'Hairspray'), Academy Award® nominee Mary Elizabeth Mastrantonio ('The Color of Money,' 'The Perfect Storm'), Academy Award® nominee Robert Loggia ('Jagged Edge') and Steven Bauer ('Traffic'). The film was nominated for three Golden Globe® Awards (including Best Actor, Best Supporting Actor and Best Original Score), and was named one of the Top 10 Gangster Films of All Time by the American Film Institute. To celebrate the film’s Blu-rayTM debut, fans were given a once-in-a-lifetime opportunity to design Scarface-inspired artwork using classic Tony Montana images from the film. Fans have now voted on the participating entrants and the favorite 10 submissions will then batured as exclusive art cards in the 'Scarface Limited Edition' Blu-rayTM. Suggested list price for the Blu-ray is $34.98 and the Humidor Gift Set is $999.99. You can find the latest specs for 'Scarface' linked from our Blu-ray Release Schedule, where it is indexed under September 6.